Sonic advertised in my neighborhood for what seemed like years before actually building a location nearby. At that point I was gibbering saliva monkey banging my head on the tv every time one of their commercials came on. There is some sort of evil genius at work here. The Sonic site further proves this theory. 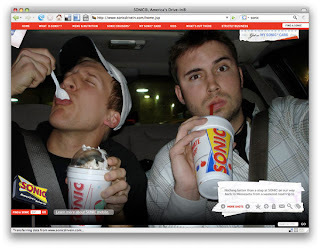 The homepage is a full-screen gallery of visitor uploaded photos of themselves enjoying Sonic. You can tag the photos, search them, or upload a library of your own. Did I say homepage..my bad....every page on the site uses one of these photos as the background. On monday I mentioned the Taco Bell 4th meal skits, and how Taco Bell didn't bring those to life on the web. Sonic created a whole section around the two guys from their spots. These two give you Sonic 101 lessons, and are just as entertaining in these skits as in the commercials. The menu section is a full-screen display as well that you explore with your mouse. 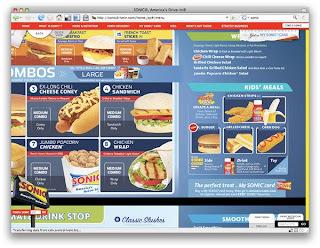 If you've been to Sonic you know the menu's are rather big, so this a fair representation of what you'd expect when you visit. 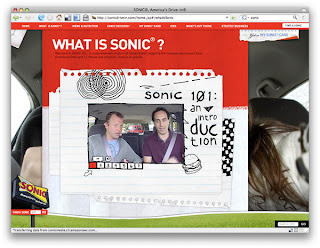 From start to finish this site ties in the Sonic advertising, the feeling of being there, and all info you'd need.